Iberiotoxin (IbTX), originally isolated from the venom of the scorpion buthus tamulus, is a potent Ca2+-activated K+ Channel Blocker (Maxi-K+ Channel Blocker). IbTX offered from PeptaNova is a chemically manufactured peptide and not isolated from animal origin or from recombinant sources. 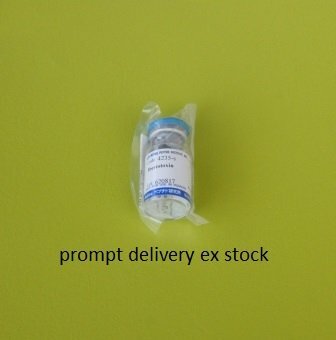 The biological activity of Iberiotoxin (IbTX) is examined by the Division of Pharmacology, Peptide Institute, Inc.
Iberiotoxin (IbTX) will be shipped at room temperature. Information about product specific storage conditions will be found on the vial. Stock solutions should be stored at -20°C. Please avoid repeated freezing and thawing.